← REMEMBER…One Word, Express In One Hundred Words In One Hundred Days. Renewal Is The Force That Rejuvenate Life To Anything That Is Called Death. It Is The Secret To Continuous Living. To Everything In Life There Is Expiring Date. To Break The Law Of Expiration, You Have To Subscribe To The Force Of Renewal. The Law Of Renewal States, Nothing Will Continue To Reproduce Unless It’s Receive Life Again. Your Greatness Is Tied To What You Love To Do With Life Inside You. Renewal Don’t Just Bring Life To Death It Also Attract Peace And Assurance To Life. 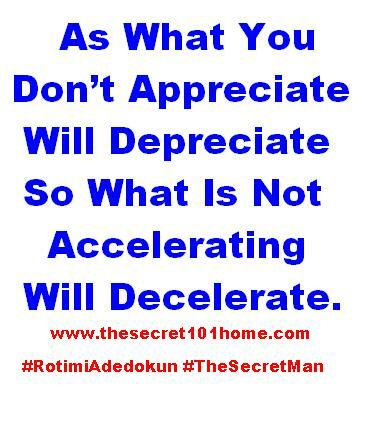 What You Don’t Appreciate Will Depreciate And What Is Not Accelerating Will Decelerate. This entry was posted in Life and Time Management, The Secret, Vitamin Of The Mind, You! and tagged Bishop David Oyedepo, Expiring Date, Jim Rohn, Life And Death, Pastor E A Adeboye, Rotimi Adedokun. Bookmark the permalink.